There are 17 minutes left in the second half against Washington, and the shot clock is running out. Brittany Boyd is dribbling around for a possible shot. With four seconds left, Boyd snakes through four Huskies and drops a floater inside the basket as the clock ran out. And on the sidelines, all Cal women’s basketball coach Lindsay Gottlieb can do is smile and shake her head. 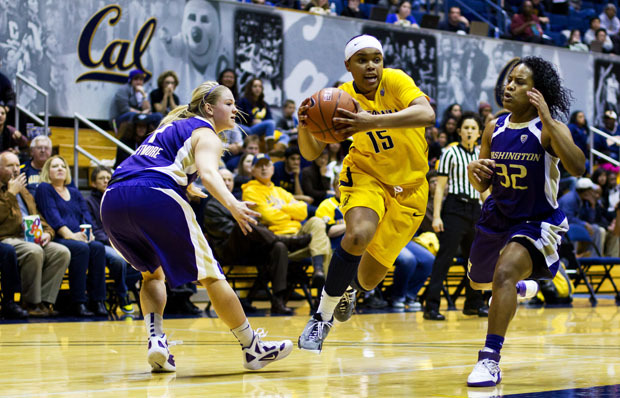 It was one of the many displays of the Brittany Boyd magic on Thursday night at Haas Pavilion. With 14 points and eight assists, Boyd was flashy and effective, generating points that helped the Bears cruise to a 71-47 victory. After being swept by the Los Angeles schools to open the Pac-12 campaign, Cal (15-4, 5-2 in the Pac-12) has extended its winning streak to five games. From the first possession of the game, Cal took the lead and never looked back. While Boyd was the star of the night’s show, guard Layshia Clarendon was the opening act. Nearing her 1,000th point in her Cal career, Clarendon had the hot hand to score the first seven points of the contest. The Huskies’ shooting, on the other hand, was ice cold. Despite having two of the top 10 scorers in the conference, Washington scored only six points in the first nine minutes. It took the Huskies 14 shots to drain their second field goal of the game. Much credit to Washington’s drought has to be placed on the Bears’ lockdown of center Regina Rogers. Rogers, who averages 16.2 points and 7.8 rebounds, is a physical specimen on the court, with her size nearly doubling that of center Talia Caldwell. Despite Rogers finishing with 13 points and eight rebounds, Cal was able to contain Rogers from the start, rendering the Huskies’ usual offensive gameplan useless. After the 11:30 mark, Washington called a timeout and pulled out Rogers for a smaller yet faster lineup. With Rogers out, the Huskies’ offense morphed into a completely different team, and the makeover helped Washington thaw out of its ice-cold shooting. As the Huskies began to warm up and nail their shots, Cal slowed down and its lead began to shrink. With Mollie Williams and Rogers slowly churning points, the once 11-point lead was cut to six with a minute left on the first half. But as the Bears proved throughout the season, they are a second-half team that steps up a notch. Opening the first six points of the second half, Caldwell widened Cal’s lead back to 10, killing off Washington’s momentum from the first half. Benefiting from the exhaustion and limited action from Rogers, Caldwell scored 14 points from the second half, finishing the game with a team-high 18 points. Another player who reaped off Rogers’ absence in the post was Boyd, who spent the second half either driving inside the lane for a layup or dishing the ball to the fearsome four under the post. After lighting up the court for 36 minutes, Boyd was subbed out of the game with a standing ovation with two minutes left.